We traveled with one other couple and we both really loved our stay with Greta and Al. The rooms were very nice and the hospitality was excellent. The breakfasts were excellent as well with Al's touch in the kitchen. Greta was a great hostess and was very helpful with directions to sights in the area and places to dine in town. we followed her recommendations for dinner and were very pleased with both places she recommended. It is a short walk to town which was ideal. We highly recommend this place! Very nice. Greta and her daughter was very friendly and prepared a nice breakfast for us. Location is very good - five minutes walking from downtown. Very clean and inviting place to stay. Enjoyed our time here and would definitely recommend to other visitors. This was my second stay at Algret House in two years. A close walk to town, comfortable rooms and a delicious breakfast with fabulous scones all from a warm and accommodating host! !Wouldn't stay anywhere else in Killarney!! Hope to see you again Greta!! A lovely guest house. A very nice room, excellent breakfast and a very attentive host. Very conveniently located within easy walking distance of the town centre. I'd definitely stay here again if the opportunity arose. We were a party of 7 adults. All our rooms were spotless and very comfortable. Greta was a great hostess. Breakfast was the best. The location is very convenient to town, a short walk. I would stay here again in a heartbeat. I stayed here for three nights during my 2 1/2 weeks driving tour of Ireland. Greta was a wonderful host and I chatted with her like an old friend. The many things I like about Algret: 1 Greta, of course, a friendly, helpful and all around pleasant host; 2 Clean all around; 3 Nice shower after the miserable ones I had and would later experience; 4 Location - in a quiet residential neighbourhood about five minutes or so walk to town; 5 Safe, private off-street parking; 6 Wonderful breakfast. 7 Good wifi; 8 Reasonably priced. The bedroom and en suite bathroom were small in my single room but I didn't feel cramped in any way. Perhaps it had something to do with the layout. I felt quite comfortable. This would be my first choice if I'm ever back this way. Loved our stay at Algret House!! Room was great, hosts were very nice, and breakfast was delicious!! Loved the porridge/oatmeal!! Would definitely recommend that others stay here!! Best bed and breakfast in the Killarney area!!! Greta is so kind and accommodating and the rooms and breakfast surpassed all expectations! The property was very easy to find and Greta was very welcoming. Our room was very comfortable with an en-suite. Greta gave us directions into the town centre, which was within walking distance and very easy to find. And an exellent breakfast to start the day. We would certainly recommend this B&B and if we are in the area again we'll certainly book there. Wonderful stay at the Algret House! Our hostess, Greta was so accommodating. She arranged a tour for us and provided a lovely breakfast. The B&B is within walking distance to town and was very clean. Once again, Greta made us feel at home. She continues to be a very gracious hostess and loves to chat with her guests when she is able. Our room was cozy; the breakfast delicious and very filling! She is located 5 minutes walking to downtown. The Algret House is wonderful. Greta and her husband are cheerful and efficient hosts. The rooms are comfortable and well set up. The house shines with impeccable cleanliness. We stayed on our first and last night of walking the Kerry Way. Our hosts at Algret were a font of great information on the Way, Killarney, and any other question we had. They helped book our first night on the Way. 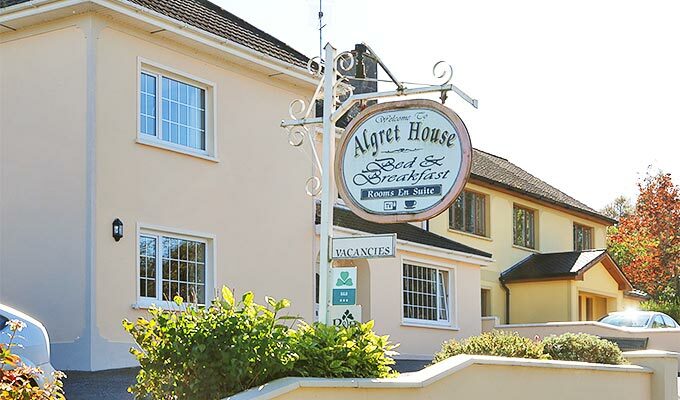 We recommend the Algret house without reservation, it is simply a great stay. We had a wonderful stay here. Greta was a lovely hostess. We enjoyed our chats with her. We were offered many choices for breakfast and the service was good. Food was plentiful and satisfying. Rooms were clean and place was quiet at night. Good location - within walking distance to shops, restaurants and Ross Castle. We would stay here again. We very much enjoyed our stay at Algret House. It was very clean and had everything we needed. The bed was comfortable and it was peaceful and quiet there. The breakfast was delicious every morning. Greta, the owner, was so nice to us and very helpful when we had questions. We highly recommend this B&B and hope to come again some time. Wonderful B&B. Just loved Greta and her husband. We felt welcomed from the moment we arrived. Our room was very comfortable and clean. Breakfast was very good, plenty of options. Located very close to town, it took us just over 5 minutes to walk to restaurants & shopping. We will definitely stay here the next time we are in Killarney. We had a lovely stay at Algret house. We felt so welcomed when we arrived! The room was beyond clean and the shower was great. There cannot be enough compliments on the amazing breakfasts we had at Algret house. The location was perfect, a very short walk to all of the nightlife and restaurants. We would absolutely stay here again! Very good and cozy place to stay. Greta greeted us personally and showed us around. Breakfast was wonderful. Room was small, entirely as expected. It was close to the streets full of shops and restaurants - tho we couldn't walk there, due to physical issues, but we found street parking. No complaints! A nice place near the city but quiet. Very friendly hosts. Nice and quite place, comfortable rooms, good breakfast! Very good position, close to city center... Friendly owner. Algret house is a great B&B to stay at in Killarney. It is centrally located to town and the rooms are very clean, spacious, and inviting. The hot breakfast is delicious and overall it is a very good value for your money. In July we stayed here for the third time. We had a family room 2 adults, a 10-year-old which is big enough if you just stay for the nights. The whole place is spotless clean. We most liked the breakfast, especially the nicely decorated waffles. The location is great because you easily walk into town within 5 minutes. It was great to see Greta again and might come another time! We were very happy with our stay at Algret House. It is an easy walk to the town centre, restaurants and entertainment. Greta is a warm and wonderful host, very welcoming to all of her guests. The room was comfortable, good shower. Breakfast was of high quality, and she even had gluten free toast for me. Greta also helped us with a bus tour of the Ring of Kerry. We stayed at several hotels and b&b's over the course of a recent 3 week trip in Europe, and Greta was one of the friendliest people we came across. The House is in the most ideal location if you want to be close to everything, yet not right in the middle of it. Within 5 mins, you are in the heart of the town, yet as soon as you turn off the main road, the quiet estate just helps you to unwind. Especially when you're crazy enough to sign up to the Gleneagle Half Marathon. And the homemade scones are to die for!!! Hope to be back soon. Great stay. Gretta is the perfect host. Liked our planned stay so much we returned when another B & B wasn't working out. Would absolutely stay there again. Wonderful B&B. Very friendly hosts, clean, comfortable accommodations with lots of homey touches. For example, they have a handful of international power adapters. Great place. Very clean & comfortable. Very easy walk into town, located in quiet neighborhood. Breakfast was great. Great communication and friendly greeting. Would definitely stay here again. Outstanding accommodations easy walking distance from the center but out of the fray. Greta was a great and helpful host who also served a delicious breakfast. This is a new, well-constructed B&B. Very solid and quiet. Highly recommended. Our visit at Algret House was perfect! Our hostess, Greta was delightful and so friendly. I would highly recommend this B&B to anyone who would like to lodge within walking distance to downtown for a fair price. Had a wonderful two night stay in May. Greta was so welcoming and friendly. Gave us a lot of good information so touring locally. Would definitely return and recommend. Loved the breakfast options and the waffles, so yummy! Wonderful B&B experience with Greta. Accommodations were perfect and extremely well priced. Quick and easy walk to the center of town. Super easy access to the ring of Kerry and Dunloe Gap. 10/10 would come here again! Great B&B. Very nice and friendly. Fabulous! Greta was wonderful. Nice rooms, delicious breakfasts. Wonderful place! Greta and her husband are the perfect hosts. The breakfast was my favorite. The room was very clean and comfortable. The location was perfect, only a few minutes stroll to the square in Killarney, but still in a very quiet area. I hope to stay here again. We 6 adults stayed for 3 nights at this wonderful B&B. Only a short walk to Killarney center and restaurants. Rooms very clean with comfortable bed and bathroom, delicious Irish breakfast, Greta is very attentive, really friendly and helpful. We recommend for any short stay at Killarney! This nicely located B & B was well appointed and our room was better than we expected. The hosts were very accommodating and tended to our needs and questions. They made excellent recommendations for local attractions and restaurants. Breakfasts were varied and well done. We recommend highly. I stayed here in June with my husband and two daughters and had two rooms. From the moment Greta opened the door, she was so welcoming and helpful. The rooms were lovely and Gretas breakfasts were delicious. Nothing was a problem for her. The B&B was ideal for walking into the town and I would definitely book there again. We had a great two night stay at Algret House. Greta was lovely and very helpful. House was spotless! Breakfast was delicious. I would definitely recommend this B&B! I enjoyed my stay very much. Very pleasant and welcoming hostess. I would go back. We LOVED Greta's bisquits!!! She was awesome, great location, very clean. She was a sweetheart. This B&B is a charmung one with a gracious hostess. Rooms were comfortable and clean, the very best thing is its central location. It's a short walk to the center of the business area and restaurants, and yet, far enough away that there is no noise. It was a very lovely place with a nice room over looking the mountains. The owner was very welcoming. They have only showers in the rooms. Algret house is a great room for a stay in Killarney. All rooms are ensuited. The rooms and the bathrooms look great, new and are very clean. The breakfast had a large variety - cereals, fruits, joghurt served on a table in the dining room and in addition we could order fresh made eggs, waffles and porridge. Greta does everything to make her guests feel comfortable. She is very friendly and caring and tries to make everything possible. The Algret House is not in the city centre but it is just a ten minute walk which makes it perfect when you travel with a car and don't want to drive into the city. The parking lot is in front of the house and free for guests. Greta also had good recommandations for food in the city so just ask her. FYI: Greta prefers paying in cash if possible. A really nice place to stay. Greta is lovely, rooms are clean and the breakfast absolutely amazing! Really good expérience! Everything was very nice. We had the opportunity to come and go whenever we like to after check-in Breakfast was freshly made every morning The romms had everything we needed TV, Hair dryer, shower etc. The B&B is close to the city centre, where you could find a good selection of restaurants and everything We definitely recommend this place !!! We had a very brief, yet wonderful stay with Greta. The house was very clean and comfortable. Our family room with three beds was the perfect size and the bathroom was great. The breakfast in the morning tasted amazing, the best breakfast we had while visiting Ireland. The location to town was just a short 10 minute walk, so it was in a great location. Greta was very kind, and I would certainly look to stay here should I find myself in Killarney again. we enjoyed our stay. The rooms were very clean and the breakfast was made to order and the price was very reasonable. I wish we could have stayed longer. Very friendly hosts. Comfortable rooms. I had a great 3nights-stay in Algret House. Everything was as expected. Warm and friendly welcome, warm and quiet rooms i.e. I would ever come back! Algret House was cosy, clean and close to town. I received a warm welcome and had everything I needed for a weekend of climbing in the Gap of Dunloe. I was able to air and dry equipment in a utility room behind the house and had a fridge in a common area for prepared food. In the room I had a hot water 24hrs, a very comfortable bed and many, many TV channels. Every morning at 8am I arrived down for breakfast and was greeted with everything I could want and served quickly with a hot breakfast and left with my flask full of hot water for the day. This is a great B&B in a great location. 2 minute walk from the town centre. We had a great time at Algret. Good rooms, good shower, good breakfast and perfect location to head into city but not beeing right in the trouble. Great location within walking distance to town, but not right in the center of things. Amazing, kind, helpful host. Clean, cozy, good sized rooms. We were in Ireland for nine nights and this was without a doubt our favorite B&B we stayed in. Cannot say enough good things about it! We came here for the third time and it was wonderful like usual. Greta is a very friendly host and makes the best porridge in Ireland. We were 8 persons and everything was ok. Clean rooms, very good breakfast and a wonderful Host Greta helps us through our stay for 3 nights. Great location within short walk of city shops and restaurants. Friendly, helpful hosts. Very clean. I've recommend it to my friends. We have been very well here. It's very clean and breakfast is excelent. Lovely B and B. Rooms were clean and comfortable. Breakfast was fresh and lots of options available. Short walk to the Main Street and national park entrances. We would highly recommend to any guests travelling through Killarney. Algret welcomed us so nice and she made us felt like home, the room was very clean and tidy, I think it has the necessary to spend a good night. The breakfast was really good! A very nice place with comfortable beds and great brekfast, less than 10 minutes walk from centre town. You'll enjoy the hospitality of Greta ! Uncomfortable mattress and dead pillows. We both had sore necks the next day. The bed is the most important aspect of accommodation. For the price, the beds should have been of better quality. Very nice place to stay helpfull & friendly would recommend. Great accommodation, very clean and friendly hostess. Breakfast was lovely as well. The house is well located in a quiet residential neighborhood. It's a short 5-8 minutes walk to town. Greta Doyle the hostess is very friendly and outgoing and helpful. We found the breakfast to be good and basic. Only the dry cereals are buffet. Everything else is cooked to order by her husband Al. The rooms were obviously the result of a renovation of an existing house. Our room was clean and neat but a little cramped. There was really no place to sit in the room and comfortably read. You needed to go downstairs for that. One thing that Greta should have warned us about was not to drink the water from the faucets in the upstairs rooms as it comes from tanks and not directly from the City water system. But Greta would happily fill water bottles downstairs if requested. We would stay there again. I want Greta to adopt me! I love her! Her place is beautiful and comfortable! Probably the best place I stayed in all of Ireland! If I ever come back, this will be my only choice! ... Oh my! Did I mentioned her scones!!!! A.maz.ing!!!!! Very friendly host. Best cooked to order breakfast of our trip. Very good value. A great place to stay, Greta went out of her way to make sure our stay was perfect! Gretta greeted us and her kind manner continued for our stay. She served a lovely breakfast. The rooms were very clean and comfortable. It was an easy walk to downtown Killarney, which is very charming and fun. It was also an easy drive to the Muckross house and the national forrest. Great room, great location, great breakfast, great hospitality! We were pleased to be offered a downstairs room which was quite spacious. Greta was a jovial hostess and imparted her local knowledge readily. Her breakfasts were delicious. It was a short walk to restaurants and pubs for dinner. WE LOVED the Algret House. It was in a perfect location for us - an easy walk to the center of town and easy access to food and beverages! Our breakfast was sooo godd - hats off to the chef!! Greta was so pleasant and helpful - the whole visit was a 10!! Not only is the Algret House spotless clean and well maintained, but also will guests find Greta to be extremely welcoming and caring. Always in the mood for a little chat, she will most gladly assist you with your travel needs. The two of us stayed for four nights at the Algret House and really liked our room. Make it down on time for breakfast so you don't miss the fresh juice, homemade scones, fruit, cereal & milk, and your choice of a warm breakfast. Make sure to call Greta directly or e-mail through her website and ask for her preferred means of payment in order to support this Killarney gem! Nice location, friendly staff, good breakfast. In the top 5 of B&B's we stayed in on our trip. excellent accueil ! très bon petit-déjeuner, et chambre très confortable. Recommandé ! We were so happy to finally get to Algret House B&B after a long day of travel from the US. We arrived around 1 pm, and Greta had our room ready - we were thrilled. The location is great - close enough to town to easily walk, but far enough away that you don't hear all the noise. The only downside was that we were in room 10, on the ground floor near the breakfast room. So we could hear whenever guests came in the front door late at night and when everyone came down for breakfast in the morning. Not a huge issue, but something to keep in mind. The bathroom was quite small not uncommon in European B&B's, but was nice. Overall we had a great stay and Greta happily recommended a tour and arranged it with a local tour company on our first day. I highly recommend Algret House! We enjoyed a most warm and welcome stay with Greta and Alf. Lovely people, friendly and attentive to your every need. The house was beautifully clean, bedroom big enough to spread ourselves, with nice clean bedding and lovely white towels. Breakfasts perfect, you could enjoy anything from cereals to full Irish, with scones, of course home made and beautiful. Greta supplied all necessary information to enable you to get the most from your stay in Killarney. Within easy walking distance from the town, exactly the right position and very quiet too. When we visit again we will definitely look here again for accommodation. This beautiful B&B made our stay in Killarney perfect. Situated in a quiet area and only just 7 minutes walking distance from the city centre. Greta is a charming host and we felt warm welcomed. The rooms are tidy and comfortable, the breakfast delicious especially her homemade scones.Thank's for everything. Very nice B&B, close to the centre of the city. What a wonderful B&B, made exceptional by the lovely Greta. Everything was excellent. Very comfy rooms. Delicious breakfast, Al makes the best scrambled eggs I have very eaten! Greta gave excellent options for supper and great advice for travel directions etc. I would recommend this place to anyone. My stay at Algret was simply great. The owner is most friendly and efficient. The house is just beautiful, best maintained, absolutely clean. My room no. 8 was very cosy and quiet. TV with hundred channels and fastest Internet. The bed so very comfortable. The breakfast was excellent and with big choice. It was a wonderful stay - also at reasonable price. Highly recommended!!! Fantastic B&B. Greta is a brilliant host and could not have made us more welcome. Very convenient location. This is the perfect B&B! The location is ideal, Greta is a wonderful host, the rooms are very clean and the breakfast is delicious and made to order. We would highly recommend Algret House to anyone visiting Killarney. This is our third time staying at this B&B and we love it. Our hostess, Greta is the best she welcomes us when we arrive and shows us to our rooms. The rooms are well appointed, perhaps there could be more drawers for clothes, but that's a small problem. Breakfasts are delicious and there are plenty of choices. Greta is happy to accommodate any breakfast request within reason. She provides freshly baked scones each morning as a little extra. Greta is always willing to suggest day trips in the area and of course she also recommends good restaurants for dinner. We have tried each one she has recommended and they were all very good. If I have the chance to come back to the Killarney area I would definitely chose Algret House. Very nice, very comfortable and warm and loving B&B. Greta is a one of a kind and very lovely woman who made our holiday in Ireland simply perfect! Thanks! Great location, very nice host! Room and bathroom were very clean, very comfortable beds and no noise at night. Great choice of breakfast! A lovely b and b with nice people and good breakfast. Great location. Would have been good to know where the drying room was. Heating put on earlier would be good. Algret House was our favorite B&B we stayed during our trip to Ireland. Greta and Alfie were warm, friendly hosts that made us feel welcome from the start. The rooms are very comfortable and breakfast was delicious! We'll definitely be booking again if we're ever in Killarney. Stay here! Our family spent three nights at Algret House in two rooms and both rooms were very satisfactory, clean, nicely decorated and comfortable. Greta was a perfect hostess. The beds were comfortable; the breakfasts excellent and Greta had lots of information for us. We had a car and there was suitable parking at the house. We walked downtown easily for meals and being tourists. Greta arranged a tour of the Ring of Kerry for us on one of the days giving my husband a break from driving for a day. We visited Killarney National Park and the Muckross House and Farms on another day. It's a lovely B&B in a beautiful area. I highly recommend it. Staying at Algret House is always a highlight of my trips to Ireland. I traveled to Ireland in October of 2011, 2012 and 2013 and this is the only B&B I returned to every time -- because of Greta Doyle. She is a gem. Funny, kind, refreshing and everything you could ask for in a host. And her husband, Alf, although behind the scenes, is a gem, too. This B&B makes you feel like you are home. The rooms are comfortable -- and immaculate. Roomy, cozy and sparkling clean. And one must always remember the breakfasts. The delicious breakfasts. The porridge is made with extra special love. I have come to feel that I cannot imagine an October without Greta Doyle in it. How great is Algret House, Great rooms, Very friendly owners, Great breakfast, We would recommend Algret to anyone, Thankyou for making our stay enjoyable. Very Very Beautiful, Nice and good !!! Algret is set in an ideal location, nice and quiet but only a few minutes walk from town. We were greated by a very friendly and welcoming hostess, Greta. We would definitely stay there again. Highly recommended. We were three friends that stayed in Algret house for 4 nights in the start of August. The host, Greta, is great, and the B&B fully lived up to our expectations. 6 mins walk from Killarney it is optimally located, and the B&B was kept to a high standard with good rooms, good beds, small but functioning ensuites, and a great breakfast. If I go to Killarney I would definitely consider staying there again. We stayed at the Algret house twice - once at the beginning of our trip and also once at the end. Really enjoyed both stays, Greta host is very friendly and helpful, and her home made scones for breakfast are a hit! The house is very conveniently located about 10 walking minutes from Killarney's centre/train station, in a quiet area. The rooms are well equipped and clean, we all had good sleeps. Can recommend this house to everyone! I visited Algret House in June 2013 and stayed for 3 nights. The room was a good size, clean and was very comfortable. The bathroom was also very clean and well appointed. Breakfast was excellent with many options whcih was great for a multi-day stay. An example of just how accommodating Algret House is was my first morning breakfast. I asked for flavored yogurt, and was apologetically told all they had was plain, but she could bring me some honey to sweeten it. I was perfectly fine with that, but the next morning there was vanilla yogurt for me. Greta took the time to go to the store and bring in flavored yogurt for me! I was very touched that she would do that. This is the kind of service you will get at Algret. As for location, the B&B is within easy walking distance of Killarney town, but it is down a quiet street. You will not regret staying here and I look forward to coming back. Fantastic hospitality from the lovely Greta, rooms wonderfully clean and comfortable. Great breakfast and yummy scones to set you up for the day. Short walk to Killarney town centre, very pretty environment. Greta runs and excellent B&B and was a superb hostess. She has the best oatmeal we have ever had!!! She offered great advice on attractions and regarding the local town centre, which was an easy walk from the B&B. The only shortcoming was an absence of hooks or towel racks, which would have been helpful for a family of four. We would definitely recommend others to stay here. We spent three nights at Algret House and had a wonderful experience. Greta took care of our every need and made us feel very much at home. She made arrangements for a cab to take us out to Muckross House and was willing to do much more for us if we had the need. We found the breakfasts to be very well prepared and appreciated the variety of offerings. Algret House is very well maintained, clean and comfortable. It is in a residential area which is quiet at night but within an easy walking distance to downtown attractions and Killarney National Park. We arrived in Killarney by bus after traveling 24 hours from Oregon and we had no problem walking to Algret House from the bus station. We would highly recommend Algret House to family and friends should they decide to visit Killarney. Thoroughly enjoyed our stay at Algret House, our room was extremely comfortable and the breakfasts were wonderful, set us up for the day. Would thoroughly recommend this accommodation, easy walking distance to all amenities and trips arranged for us. Hope to be back again one day. My husband and I stayed at Algret house for three nights, and it was a cheery, hospitable place to use as our home base. We were so happy we chose to stay here! Very friendly, clean and tidy, excellent breakfast choice. would definitely stay again. I had an extremelly positive experience staying with Algret House B&B and Greta is an amazing host. Her warmth and caring makes you feel very welcome. Also I must add a very positive note to the hygiene of the place. I highly recommend it. great location, incredibly friendly-gracious hostess, the rooms were light, spacious and clean - good walking trails and sites outlying the town. I would go back and stay for longer! We stayed 3 nights at Algret House. It was a ten minute walk to downtown Killarney and in a quiet residential neighborhood. We had no car so we used taxi's to and from the train station could have probably walked this but we aren't as young as we used to be and Muckross House, all arrangements were made by our hostess. She even made the arrangements for the Ring of Kerry tour and they picked us up and dropped us off at the door of Algret House. The house was immaculate, the breakfasts were cooked to order off of their menu and got us off to a good start each day. There were 4 of us traveling and we had two rooms. If there was anything to "complain" about, it was the small shower in one of the bathrooms, but other than that I would recommend this B & B. Oh, by the way, she also gave us advice on which places to eat and all 3 were very good. We are very happy that we could stay at Algret House. Nothing negative to say. wonderfull staying there. Very recomendable B&B. Maximum score. Once again a very nice stay at the Algret House B&B. Perfect breakfast, service and very close to the City Centre. It was an excellent accomodation located nicely and run perfectly by Greta! Thanks a lot! Our stay in Algret House was great! Our family stay at Algret House was wonderful! Greta was so welcoming and helpful with all of our needs The accommodations were clean, modern and very comfortable The location was perfect for walking to center city to enjoy the pubs and shopping We stayed 2 nights but would have been happy to have stayed longer Great little parking lot out front Therer was nothing we could have wanted or asked for from this great B & B! wonderful, comfortable room; helpful and gracious host; great neighborhood and location and awesome breakfasts - would definitely stay here again!